What is Varada Mudra? This mudra denotes the act of charity, liberation, benevolence, with the associated emotions of sincerity and compassion. It is conveyed with the left arm extending downwards, palm facing in an outward direction. This mudra is made with the left hand and most often you can see it in conjunction with other mudras, such as the Bhumisparsa or the Abhaya mudras. Varada Mudra is typical of Buddhist iconography from Southeast Asia. In India, varada mudra is used in images of Avalokitesvara from the Gupta Empire (4th and 5th centuries). Deities who are bestower of wealth are depicted cupping a fruit or jewel in their right hand. Fourth and fifth century figures of the multi-headed Avalokiteswara often display this mudra, wherein nectar flows from one of his open palms to assuage the thirst of ancestral spirits (pretas). This mudra is also called a boon-granting mudra, because it helps bestow a specific quality of energy one might be seeking from an enlightened being. Often you can see a sacred shape, such as a mandala, or an eye in the palm of the Buddha hand. This expresses further the rarefied and powerful energy emanating from an enlightened being through his or her hands. So where is the best FengShui placement for a Varada Mudra Buddha? 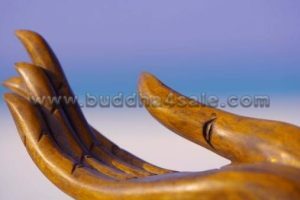 It is highly recommended to consecrate a Varada Mudra Buddha at the northwest Bagua area of your home and office, etc. Just by looking at this Buddha hand gesture one can connect to the energy of deep peace and serenity. It is a powerful FengShui decor adapt to any places!